Free Photoshop Frames And Borders Brush Set from Stephanie. We've been asked by so many Photoshop brush lovers for a good CD of Photoshop brushes that they could purchase, and now we've found a totally beautiful package for you. One of our favorite brush artists is Janita of the Seishido.biz website, a popular site for the Photoshop brush crowd, and Janita has put together a fantastic CD called ThinkBrushy. This is a very sweet package of her very best work and features 50 stunning Photoshop brush creations, 50 magnificent textures, a 30-day site membership card, a free ThinkBrushy lapel button, and lots of brushy love from the brush angel herself. The CD is $29 for a Personal Edition (some usage restrictions) plus $5 shipping, and $99 for the Commercial Edition (no restrictions) with free shipping. To order visit the Seishido.biz site and look for the "buy now" links just over the image of the CD kit. Want to learn more first? Read on for all the happy details  including free samples of Janita's work. 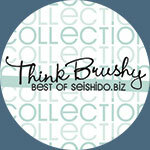 ThinkBrushy is an Indy Production and is exclusive to Seishido.biz. 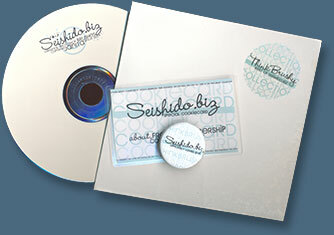 Seishido brushes and textures are sold in 2 versions, the Personal Edition CD and the Commercial Edition CD. The Personal Use License allows you to use the brushes and textures for your artwork, but you are not allowed to claim the copyright to the contents of the CD, and you are not allowed to use the brushes and textures on commercial projects. The Commercial Use License allows you to use the brushes and textures on commercial projects. What do you mean by independent production? That means this is not a company produced CD, it's all self-made and handcrafted. Janita even cut out the stickers to create the cookiecards herself. The badges are also handmade. Janita owns a Hello Kitty button machine! This package is made with love, and Janita wants it to be as personal as possible, and promises that each CD will be personally signed! What exactly is on the CD? You'll find 50 high quality brushsets, which are at a resolution suitable for print projects, as well as for scrapbooking or any photo artwork. Also included are 50 exclusive textures, which means that the textures have no Seishido logo printed on them, no watermarks, and no copyright symbols. One of the most popular uses of these brushes and textures is in the creation of professional looking website designs. Why a personal use and commercial use edition? By picking the commercial version you automatically receive a license which allows you to create and sell products with Seishido brushes and textures on them. You can also upgrade your personal use edition to the commercial edition anytime you decide to start using them on commercial projects. You only have to make a second payment to cover the difference in price. Design projects that do not generate revenue by using the brushes and textures does not necessitate a commercial license. Here is the complete list of brushes. There are also 50 textures included in the CD. Shipping is $5 for the Personal Edition and free for the Commercial Edition. Normally CD packages will be delivered within a few days inside Europe and 7-10 days later worldwide. Orders are processed and shipped when they are received, Monday to Friday, so hopefully you won't have to wait too long! Payments are made through Paypal. Europeans can also make a payment via a bank account. If you do not have access to Paypal or a bank account, send an email to support and we will offer you different payment options. To order visit the Seishido.biz site and look for the "buy now" links just over the image of the CD. What exactly is the cookiecard for? 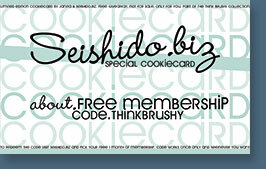 The cookiecard is a virtual code you can use for a free month of Seishido membership. The code can be used anytime you want, and the free month of membership starts on the day you redeem the code and receive your membership info. A detailed cookiecard guide and instructions on how to redeem the code is included on the ThinkBrushy CD. Membership includes freebies, which means you will receive 1 free original brushset and 2 free original textures. There are also creative contests that include some free downloads, 5 fonts and a randomly selected mp3 file. Every now and then special cookies are given away, including more cookiecards for free brushsets. Don't forget to add your birthday, as members receive presents every year  even after their membership has ended. The following are free samples of Janita's work. These are not included on the CD. All of Janita's brushes are tinged with an air of whimsy, from her beautifully detailed Angelic set, featuring delicate feathers, gossamer wings and dreamy clouds, to her sweetly festive Seasonal set. Download and see for yourself! Brushset Bellamie: Bellamie is a floral set including some really very cute frames and some rather interesting edges, and all are large enough to be used as scrapbook brushes. Brushset Maraqua: Maraqua is fulll of watercolored parts of the bellamie, more soft and smooth, also some different watercolor frames, and everything looks just blurry and blown away. Brushset Delicately: Delicately actually is a spring set that features leaves in different sizes. The brushes have been made of scanned fabrics and are great for texture work and also large enough for scrappers. 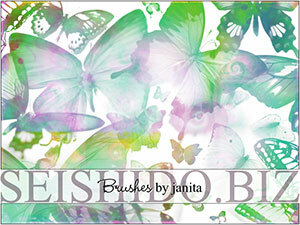 Make sure to visit Janita's site Seishido  and don't forget to join her newsletter! Seishido brushes and textures have been spotlighted by both Advanced Photoshop and Photoshop Creative magazines. Janita's brushes were also included in each magazine's accompanying CDs. 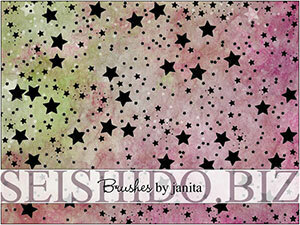 Issue #26 of Advanced Photoshop features some of Seishido's brushsets and textures on a free CD and also includes an article about the site, and tells a little about why and how Janita started to make her own brushes. Each issue is packed full of inspiring interviews and challenging tutorials, tailor-made for the more advanced digital artist, so she was in really good company. Issue #17 featured a huge amount of Seishido brushes and textures on a free CD. Photoshop Creative features inspirational tutorials covering the whole scope of Photoshop, from creative projects, to practical guides to using tools and techniques. Readers also benefit from a collectable CD-ROM each issue. 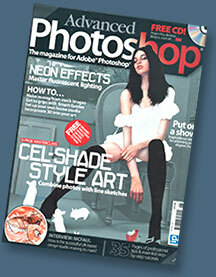 Another great Photoshop magazine!